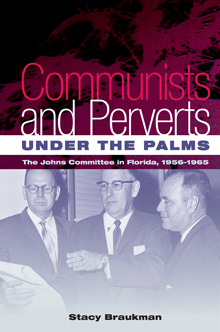 The cover of "Communists and Perverts under the Palms: The Johns Committee in Florida." Image courtesy University Press of Florida. Emory Libraries will host a conversation about Florida's infamous Johns Committee — a McCarthy-era state legislative group that harassed and intimidated professors, teachers and students accused of homosexuality — on Tuesday, April 15 at 6:30 p.m. in the Jones Room at Emory University's Robert W. Woodruff Library. The event is free and open to the public. Randy Gue, curator of LGBT collections and modern political and historical collections at Emory's Manuscript, Archives, and Rare Book Library (MARBL), will lead the conversation with Atlanta writer and editor Stacy Braukman, author of "Communists and Perverts under the Palms: The Johns Committee in Florida." Joining them will be longtime Atlanta activist Richard Rhodes, who fled Florida at the height of the committee's witch hunt against the LGBT community. "I wanted to bring Stacy and Richard here to talk about one of the things that made experiences for LGBT folks in the South so different from those in the rest of the country — the Johns Committee," Gue says. He is the co-curator of "Building a Movement in the Southeast: LGBT Collections in MARBL," an exhibition drawn from Emory's growing LGBT collections, on view in MARBL through May 16, 2014. The Florida Legislative Investigation Committee — often referred to as the Johns Committee, after its first chairman, state senator Charley Johns — was established in 1956 to unearth anyone it viewed as subversive in Florida's academic institutions, including perceived Communists and members of the LGBT community. With law enforcement cooperation, the committee monitored and interrogated countless individuals, including civil rights activists, college students, public school teachers, and university faculty and administrators. Braukman will discuss her book, her research and how she became interested in writing about the Johns committee, while Rhodes will talk about the climate of fear it created. He quit Florida State University and his job and moved to New York when a friend, who had been rounded up in a police raid on a gay bar, told him he'd given up Rhodes' name during an interrogation. "They would put your name, address, and place of employment in the newspaper" when there was a raid on a gay bar, Rhodes says. "Some people I heard about, [their employers] gave them a choice of resigning, with no references, or being fired." After he moved to Atlanta in 1972, Rhodes became the first openly gay candidate to run for the Georgia House in 1988, the first openly gay delegate to the Democratic National Convention from Georgia the same year, and the first to serve as the chairman of the DeKalb Democratic Party in 1993. A founding member of SAGE (Services and Advocacy for GLBT Elders) in Atlanta and Atlanta Prime Timers (a social group for older gay and bisexual men), he received a Lifetime Achievement Award from the Atlanta Gay and Lesbian Chamber of Commerce in 2012. MARBL has collected the materials and papers of gay figures for years, and in 2013 began a more focused effort to build its LGBT collections. As Gue researched materials to include in "Building a Movement in the Southeast: LGBT Collections in MARBL," he read this statement in a conference program: "The South's long history of racism, sexism and anti-gay bigotry caused our struggles as lesbians and gay men to be qualitatively different from that of our gay brothers and sisters in other parts of the United States." The passage stayed with him. At the exhibition's opening, Gue talked to Rhodes and another man, who were discussing their experiences with the Johns Committee. "Hearing them tell stories about the Johns Committee, it sounds unbelievable," Gue says. "The other man said he almost committed suicide because of the pressure and the hounding. That brings a very real world perspective to what people think of now as historical events. "I'd love for those who attend our talk to realize that history is living," Gue adds. "We'll have Richard, who experienced it, and Stacy, who wrote about it, and MARBL, whose collections document similar struggles. Together, they show that history is relevant, that it isn't just in the past."